Looking at a set of Kentucky Derby past performances, it’s easy to find that John D. Gunther bred a pair of contenders in Justify and Vino Rosso, and that WinStar Farm likewise appears as the breeder of two more in Bolt d’Oro and Noble Indy (in addition to the two they later bought in partnership). But another has achieved the feat of breeding two hopefuls in Derby 144 – only you have to peruse a little more carefully to find the name of industry legend Helen Groves. The Helen K. Groves Revocable Trust is the breeder of Free Drop Billy, and just below him on the points list is Lone Sailor, bred by the same Groves in partnership with daughters Helen Alexander and Dorothy Matz. If the Matz name sounds familiar, you’re probably thinking of the U.S. Olympian-turned-Thoroughbred trainer Michael Matz, best known for conditioning 2006 Kentucky Derby legend Barbaro. He’s Dorothy’s husband. Groves is the daughter of Robert Kleberg Jr., the impresario of King Ranch, famous in the Thoroughbred world for 1946 Triple Crown winner Assault. Alexander picked up seamlessly from her grandfather and presided over King Ranch’s Thoroughbred holdings, until they were sold and she established her own Middlebrook Farm near Lexington, Kentucky. Together, Groves and her daughters have had terrific success by developing several key families. Lone Sailor descends from perhaps their most significant matriarch, Broodmare of the Year Courtly Dee. She was purchased for $900,000 in foal to Alydar at the 1980 Keeneland November Breeding Stock Sale, and the baby she was carrying ended up being Althea, the champion two-year-old filly of 1983. Bred by Groves and Alexander in partnership with David Aykroyd, Althea romped in the 1984 Arkansas Derby (G1) and went off as part of the favored entry in the Kentucky Derby, but tired to 19th behind Swale. Althea went on to a distinguished broodmare career. Her descendants include Arch (bred by Groves and Alexander), the sire of champion Blame who denied Zenyatta in the 2010 Breeders’ Cup Classic (G1) as well as the sire of Derby 144 foe Instilled Regard. Other offspring of Courtly Dee have proven influential too. 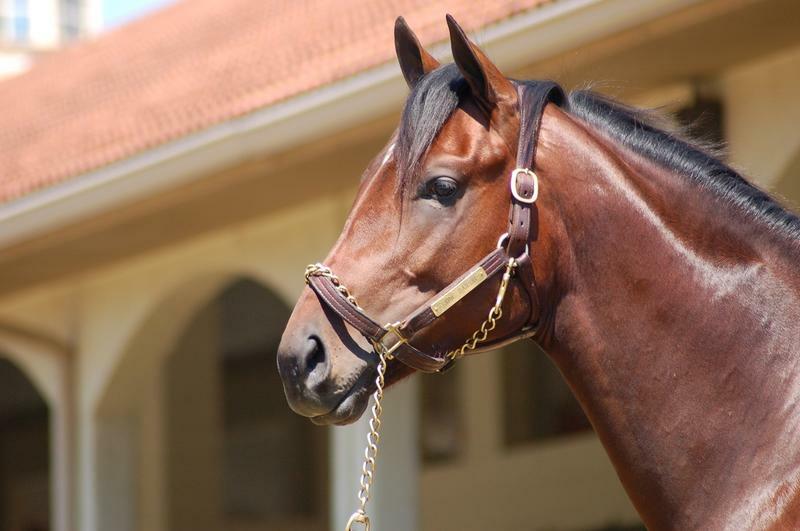 Althea’s full sister Aquilegia is the granddam of 2014 Breeders’ Cup Classic hero Bayern. Himself bred by Alexander, Bayern is by Offlee Wild, who was bred by sister Dorothy Matz. Another full sister to Althea, Aishah, is the ancestress of Lone Sailor. The winner of the 1990 Rare Perfume S. (G2), Aishah produced six stakes performers, chief among them 1998 Go For Wand H. (G1) heroine Aldiza (by Storm Cat). Aldiza’s daughters are maintaining the momentum by producing graded-caliber runners of their own, her descendants including Grade 3 scorers Timeline and Far From Over. One who may join them at that rank is promising sophomore Just Whistle, a recent Keeneland maiden winner for Groves and Michael Matz. Matz also trained Ambitious, Aldiza’s filly by Mr. Greeley. Winless in nine tries, Ambitious has gotten off to a better start as a broodmare with Lone Sailor as her first foal. He was the result of her tryst with the A.P. Indy stallion Majestic Warrior, best known as the sire of four-time Grade 1 star Princess of Sylmar, who defeated Beholder in the 2013 Kentucky Oaks (G1). Lone Sailor was foaled March 30, 2015, at Middlebrook, a little more than a month before the Groves-bred Free Drop Billy made his appearance. The two trod a parallel path through the 2016 Keeneland September Yearling Sale, when they were offered under the Gainesway banner. With his immediate parentage not as fashionable as “Billy’s” was, and looking like a leggier and less furnished type, Lone Sailor did not command as much at auction. But trainer Tom Amoss went to $120,000 to secure him for GMB Racing, the nom de course of Gayle Benson. As the months passed, Lone Sailor turned into quite a looker. Like Amoss’ other success story for GMB Racing, Mo Tom, Lone Sailor received his preliminary education with Todd Quast at GoldMark Farm. Although Quast found the two to be broadly similar types, as horses looking for a route of ground, Lone Sailor had more speed than first envisioned for a horse of his build. “Big, strong, good-looking horse,” Quast recalled. “He had some speed. He actually showed some good precocity. “Mentally he took time to come around,” for he could be “a big baby about things,” but he loved his job to go out and train. Lone Sailor is still figuring out the mental part of the game, as evidenced by his tough beat in the Louisiana Derby (G2) at Fair Grounds. Just when he appeared to have victory in his grasp, he lost focus and let Noble Indy come again to outduel him at the wire. The length of Noble Indy’s neck prevented a poignant victory for Mrs. Benson at her home track. She was mourning the loss of her husband, Tom, a celebrated figure on the New Orleans sports scene as the owner of the NFL’s Saints and the NBA’s Pelicans. His funeral, held at St Louis Cathedral the day before the Louisiana Derby, attracted a veritable “who’s who” of those coming to pay final respects. Lone Sailor was named in honor of an award that Tom Benson had received from the United States Navy Memorial Foundation. According to the Lone Sailor Award website, it recognizes “Sea Service Veterans who have distinguished themselves, drawing upon their Sea Service experience to become successful, in their subsequent careers and lives, while exemplifying the core values of Honor, Courage and Commitment.” Presidents, generals, admirals, and sports legends feature on the list of recipients, and among Benson’s fellow honorees in 2007 were baseball great Stan Musial and Sen. John Warner Jr. If Lone Sailor can put it all together on the first Saturday in May, it would be a touching tribute for Mrs. Benson, and the crowning triumph of the mother/daughters partnership of Groves, Alexander, and Matz.